With predicted increases in extreme weather events, planners across the globe are faced with the task of working with, rather than against, the environment. On August 27, 2017 Hurricane Harvey hit Houston. The record-breaking rainfall left neighbourhoods around the city under water for several days. Harvey hovered near Houston for days but recovery will take years. Why Houston was so hard hit is explained only in part by the 1.3 metre of rain that fell over the city. Weakness in government powers has hampered local and regional agencies from protecting residents. Priding itself on a pro-development policy, the city has famously weak zoning rules and regulations – laws that elsewhere control property development. And the area’s slow moving streams that Texans – tipping their hats to the Gulf Coast’s Cajun heritage – call bayous, resist taming. Attempts to make more room for buildings by confining waterways to narrow channels stood feeble in the face of Harvey. It seems there is a limit to what engineering with concrete riverbanks and reservoirs can accomplish. Three and a half months after the hurricane, on December 13, 2017, dozens of science journalists, researchers, and university PR officials chatted excitedly at a press conference during the annual meeting of the American Geophysical Union in New Orleans. The meeting is the world’s largest for Earth and space scientists. Researchers often announce new findings about earthquakes, volcanoes, landslides, and climate change there. Kerry Emanuel, a professor at the Massachusetts Institute of Technology and a leading hurricane expert, stepped up to the podium. Earlier that day he’d presented a scientific paper exploring whether global warming had intensified Hurricane Harvey. At the press event he introduced the panel – including Michael Wehner, a scientist at Lawrence Berkeley National Laboratory and Karin van der Wiel, a postdoctoral researcher at the Royal Netherlands Meteorological Institute – and promised the audience a “powerful result”. Harvey had drenched south and east Texas. More than 90 people had died. Rivers had swollen, and in metro Houston alone water damaged at least 100,000 homes, of which more than 40,000 were lost or required major repairs. The National Oceanic and Atmospheric Administration estimates that repairing damage from Harvey will cost $125 billion. It was a deadly and expensive brush with nature – and an intensity that could become the new normal. Three hundred miles west of the New Orleans press conference, a different kind of meeting about Harvey convened at about the same time. The Houston Chronicle organised a forum on responses to the storm. Hundreds of citizens packed into a hall at the paper; seven local policymakers and professors tossed out ideas for securing Houston’s future. Should the city fund new infrastructure or move people to safer places? And who’ll pay the bill? These two meetings – one placid and in the arcane language of science, the other laden with emotional tales of storm damage – represent two poles of power that will both help to determine Houston’s future. Harvey – the worst storm to ever strike the area – demonstrated once again that Houston’s citizens are at mortal risk when the city floods. Scientists say that the risk is rising and the city’s leaders and citizens struggle to face and fund an inevitably costly plan to keep Houston safe. And Houston is not alone: climate change affects the occurrence of extreme weather all around the world. In 2017 we saw floods in India, Bangladesh, and Nepal; hurricanes Irma and Maria in the Caribbean; and catastrophic forest fires in Portugal and on the US west coast. All these events pose challenges for recovery and hold lessons for cities yet to be built. 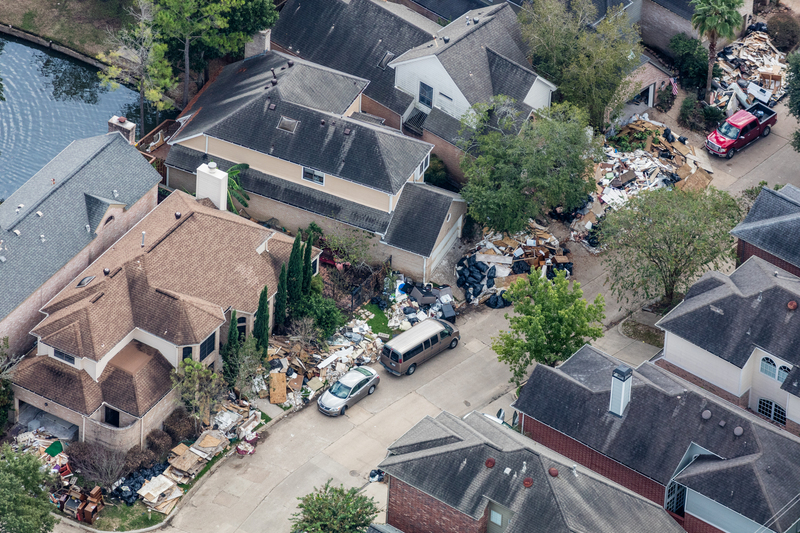 I flew to Houston a month after Harvey in a Cessna piloted by my friend Alex MacLean, a prominent aerial photographer (his photos illustrate this story). The sun shone. Municipal crews had carted off thousands of tons of debris. But from our platform, 500 metre above the city, we easily spotted wrecked houses and lives. Long heaps of waste remained by their back gardens and along the streets. Alex banked in tight circles above Briar Forest, one of the heavily affected West Houston communities. Water had coursed out of the graded banks of Buffalo Bayou – a stream snaking through southern Houston. Streams had rushed down the broad, curved streets, crept up lawns and bubbled in through cracks in floors and walls. The first 30 cm of water had destroyed carpeting, furniture, and appliances. Some houses along Buffalo Bayou had filled up to the second floor. Floods rising out of Buffalo Bayou inundated entire blocks of houses in Briar Forest. About 30 cm of water was enough to destroy floors, furniture and interior walls, all of which were hauled onto front yards for disposal. Copyright: A. MacLean. A plague of toxic mould took hold during the warm days that followed the storm. A splotchy black patina spread across damp walls. Those walls had to go. Where they’d already been carted off, the piles of rubble had left white patches of crumbled drywall etched into grass and road surfaces. Alex and I drove by car to Meyerland, another badly flooded area. A man with straight black hair stood in front of a half-built house, holding a mobile phone. He didn’t tell us his name, but he did say that he’d lived in the modest brick ranch next door. It had flooded annually for the past three years. The floods had rolled in from Brays Bayou – half a mile away – during downpours officials used to say might occur once every 500 years. In late May, 2015, 280 mm of rain dropped on Houston in half a day, and 60 cm of water had flowed into his house, “up to the second drawer of the highboy dresser”. He’d moved out. Carpenters replaced walls and floors. He’d moved back in. Still, the homeowner says he loves Meyerland, and he’s not going to abandon it. Months before Harvey he had just knocked down the house next door and built the new one where we found him. He’d had this one elevated about a metre, on concrete piers. To his relief, Harvey’s floodwaters had not reached the first floor. Even so, he’s not sure he’ll be safe in the next storm. But “there’s no place where you can avoid a disaster,” he said. A short drive away, Congregation Beth Yeshurun – Houston’s largest Jewish temple – also flooded during Harvey. Luis Dorfman, the temple’s executive director, told me that most of the building had filled with around 30 cm of runoff from Brays Bayou. Over 1 metre of water had pooled by the rabbi’s bimah, where the sanctuary slopes downward to afford congregants good views. Dorman wore a button that said “Let’s Rebuild Temple Yeshurun.” Estimated cost? “In the millions.” David Rosen, the temple’s senior rabbi, believes mainstream scientists who say that Earth is getting warmer, but adds that he’s a theologian, not a researcher. He has no idea if the Gulf Coast’s storms are getting worse. Nonetheless, he’s sure that, “if Mother Nature is talking to us, we should listen”. Kerry Emanuel, the MIT professor who introduced the New Orleans press conference, says he knows what Mother Nature is saying. “The physics are really simple,” he says. Global warming has heated the atmosphere and warmer air carries more moisture. Every storm is likely to rain more heavily. Preliminary data published last November by National Oceanic and Atmospheric Administration suggests this is what’s happening in Houston. The agency calculated that since 2002, the amount of rain falling in the rare storm, which has a probability of 1% each year (the “one-hundred-year storm”), has increased by as much as 13 cm – about 40%. At the New Orleans conference, Emanuel laid out findings he’d published a few weeks earlier in the scientific journal Proceedings of the National Academy of Sciences. Simulating mayhem in a computer program, he’d released thousands of virtual past and future “seed” storms into the Atlantic Ocean and computed their tracks. The likelihood of a storm about as rainy as Harvey has increased by a factor of six in the last 40 years, he’d found. By 2100, the chance of such a deluge will increase another threefold. Then, a Hurricane Harvey will strike Texas once every five years. Two other researchers had independently performed computer simulations to model Harvey’s rainfall. Karin van der Wiel explained her findings – published in Environmental Research Letters – that global warming has increased the probability of Harvey’s copious precipitation threefold. Michael Wehner described how he’d concluded (in a paper published in Geological Research Letters) the likely increase would be tenfold. Summarising the paramount finding Emmanuel had promised, Wehner said that despite numerical differences the three new studies of Texas storms came to “the same basic conclusion”, that there was a “significant human influence on the amount of precipitation that was produced by Hurricane Harvey” and that rainfall will grow increasingly worse. Addicks Reservoir, one of two basins – along with Barker Reservoir – that together protect downtown Houston. Together they hold 500 million cubic metres of water. The recordbreaking rainfall pouring into Buffalo Bayou, which feeds the reservoirs, pushed the water level higher than it had ever reached. Homeowners upstream, discovered to their surprise that their land was in the basin. Their houses were flooded, in some cases requiring major repairs. Water officials eventually opened gates, letting water rush out of Addicks into downstream reaches of Buffalo Bayou, flooding homes there as well. Copyright: A. MacLean. Houston sits locked in a tightening vice between rainfall-swelled bayous coursing downstream and wind-powered surges racing upstream from Galveston Bay. Rising sea levels and the possibility that climate change will bolster the strength of the most powerful storms together have increased the risk of a catastrophic wall of water crashing onto downtown Houston and the immense aggregation of petrochemical plants lining the Houston Ship Channel. The increased potential for environmental and humanitarian catastrophe has got politicians – as well as scientists – talking. After Hurricane Ike had delivered a six-metre-high surge into Galveston Bay in 2008 – causing a 400,000-gallon oil spill and $29 billion in damage – coastal planners proposed a many-multi-billion-dollar reinforcement of the Texas shore. The Ike Dike, as it has been dubbed, would combine tens of kilometres of five metre-high sand dune barriers and a 250 metre-wide retractable flood gate. The idea languished for a decade. It’s been dusted off since Hurricane Harvey. Can Houston make things safer? Experts often say that Houston’s lack of zoning rules to regulate what’s built where leave the city and its people uncommonly vulnerable. Jim Blackburn, co-director of Rice University’s Center for Severe Storm Prediction, Education and Evacuation from Disaster, says a deeply ingrained pro-development attitude serves the city’s residents poorly. “We have been more concerned about selling real estate than protecting people,” he says. Houston also suffers from an unfortunate location. The city’s founders chose a site that’s unusually flood prone, in the path of some of the heaviest rainfall on Earth. “It’s like trying to combat flooding in a tropical rainforest,” says Antonia Sebastian, a civil engineer at Rice University who has studied storm damage in Houston. Builders and boosters carved the metropolitan area – a 2.5-million-hectare region that includes Houston proper and scores of independent jurisdictions – out of a nearly pool-table-flat mosaic of oak and elm woodlands, and bunchgrass prairie grazed by bison and elk. Slow-moving bayous snaked through sedge and bullrush marshes. When it rained hard, the waterways meandered far from their channels, flooding large areas. The watery landscape had merely inconvenienced Houston’s early settlers. But, seeing the bayous and floods as an obstacle to growth, later residents and developers restrained them. 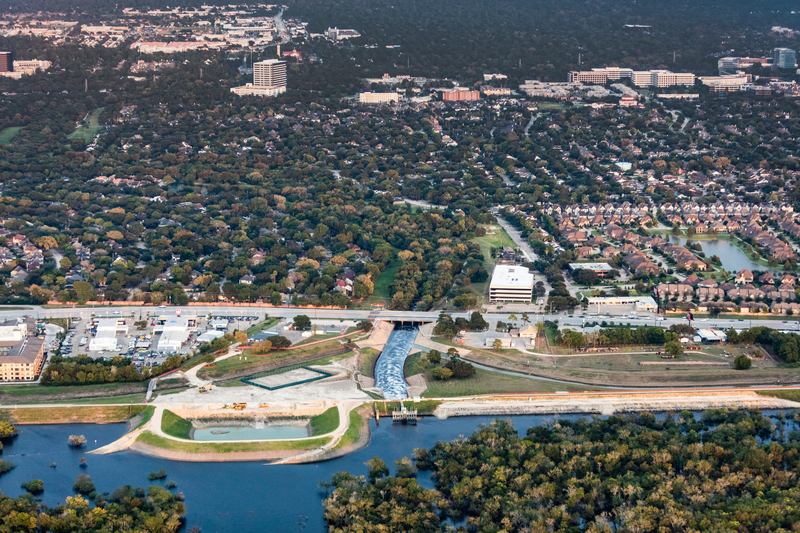 They’d drained the swamps and straightened streambeds – Brays Bayou was originally three times longer. And they’d hardened river banks with concrete, chanelling the water and – by forcing it to flow faster downstream – increasing drainage capacity. In 1935, an early winter storm had made Buffalo Bayou swell to 16 metre above normal high water, devastating downtown. 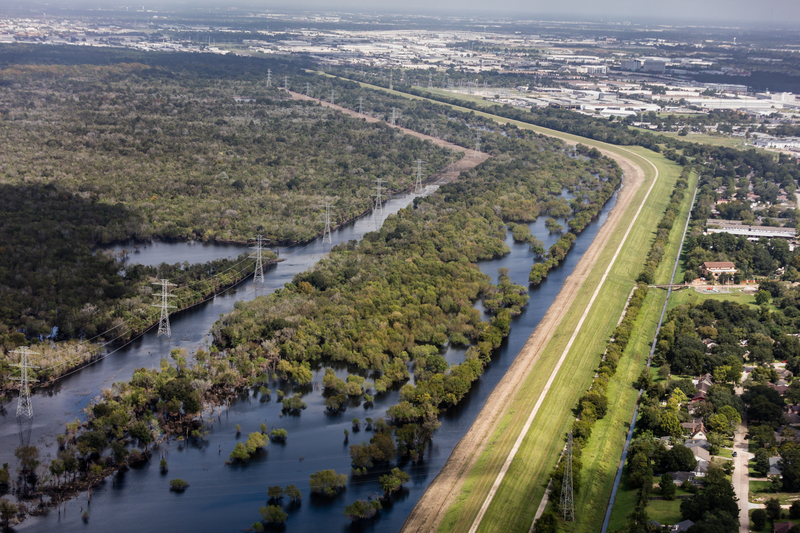 The Army Corps of Engineers had responded by building Addicks and Barker reservoirs, with a combined volume of 500 million cubic metre, for temporarily storing Buffalo Bayou floodwaters in a storm. The basins kept downtown Houston safe – until Harvey. Speakers at the Houston Chronicle’s public forum blamed everyone. Jim Blackburn, the Rice University professor, chided Houston’s establishment for not facing up to the increased likelihood of flood-level rainstorms. “We have to be honest that our climate is changing,” he said in the event’s keynote address. It seems matter of fact, but in Texas – where the political climate enforces polite terms such as “weird weather” – it’s an aggressive statement. Presenters offered many solutions. Jeff Lindner, the meteorologist for the Flood Control District of Harris County, which includes Houston, touted an additional reservoir under consideration for storing flood waters. Addicks and Barker reservoirs obviously hadn’t been big enough. At the peak of the storm, fearing breaches in the dams, the operators had opened floodgates, releasing torrents that inundated downstream areas. A third storage basin upstream of Addicks and Barker was considered when the other two were built in the 1940s. It’s back on the table now, at a cost of around $500 million. Barker Reservoir, looking from the reservoir toward the city. It shows how flooded it is, a month after the storm and how it’s outlet, the continuation of Buffalo Bayou flows right through very dense areas. Copyright: A. MacLean. In search of ideas for how to make Houston more resilient in the face of intensifying storms, some planners are studying techniques pioneered in the Netherlands for how to calm waterways before they reach urban areas. The Dutch are famous for the system of coastal dikes that protects their low-lying country from storm surge. With less fanfare, they’ve also developed plans for accommodating the heavier rainfall and higher rivers predicted in coming decades. The Dutch did the nearly unthinkable in 2007: they began construction of the “Room for the River” project, a far-reaching flood control effort with dozens of projects for letting flooding rivers flow out onto land previously kept dry behind dikes. The €2.3 billion floodwater escape valve is nearly completed. Dike authorities lowered levies in some areas and repositioned others. They dug channels to divert parts of rivers when needed. Some citizens had to be relocated and some farms had to be abandoned. Others face occasional baths, but the changes have protected millions of people: floods will be redirected before they reach populous cities downstream. 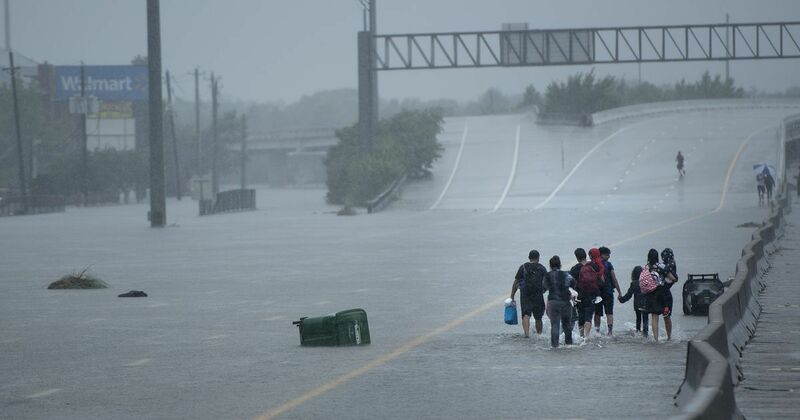 Yoonjeong Lee, a researcher at the Center for Texas Beaches and Shores at Texas A&M University at Galveston, says Houston should build Dutch-style flood protection, and she knows where. “Buffalo Bayou would be a perfect place to build a ‘Room for the River’ program.” She says the city could buy up a relatively small number of plots near its banks and – after demolishing any structures on them – construct a riverfront park. The land would be engineered to capture water when the bayou rose, safeguarding remaining districts. Houston has previously installed patches of parkland along its bayous before, but she says the city has to think bigger. Timon McPhearson, a professor in Urban Ecology at the New School in New York City, says that another way Houston should become more resilient to wetter storms is by controlling how much water rushes into bayous in the first place. He says too much of the rain that lands on the city drains quickly into waterways. “Houston is an extremely paved city,” he says. Replacing street and driveway surfaces with permeable materials will lower peak floods. He also suggests green roofs, covered with vegetation that could provide important ecosystem services that retain – and stall – some of the rainwater. McPhearson also admires Dutch innovations in floodproofing. For reducing run-off, he points to the Water Square, an urban park tucked behind the drama school Hofplein in Rotterdam. It’s about the size of two football pitches and not flashy, but its design helps keep Rotterdam dry. On fair days, students play and office workers lunch, on terraces and steps that descend into three shallow cement hollows. When it rains lightly, rivulets flow down a fanciful stainless steel gutter delighting children. On stormy days, the depressions fill with run-off. They’re pumped out, but only long after the storm has passed, lessening the burden on Rotterdam’s overflowing drainage canals. When I visited Water Square a few years ago, Florian Boer, the Dutch architect who’d thought it up, explained that the project had confronted him with an unusual challenge: how to upgrade Rotterdam’s storm-water system and simultaneously create an enjoyable urban park. In a good downpour, the basins hold nearly 2,000 cubic metre of water. That’s only a fraction of Rotterdam’s need for storm-water storage, but he said the park is “an experiment that shows that you can combine these things.” It also illustrates a common Dutch practice that Antonia Sebastian, of Rice University, says US planners and engineers should use more often: building public works with multiple uses. Since my visit, Boer’s firm, De Urbanisten, has built more water squares in Rotterdam and elsewhere. Albert Pope, an architect at Rice University, doubts that adaptation through infrastructure fixes are sufficient to keep Houston safe from serious flood damage. He says that there’s too little undeveloped land left to accommodate new reservoirs of sufficient capacity, and that further straightening, widening, and bank-hardening can’t force bayous to carry more water. “We’re at the limits to what we can do, engineering-wise,” he says. His solution is more disruptive of the status quo, and Houston’s fix-it-with-concrete ethos. He insists that Houston should do something more transformative and remove all the buildings in its flood plains – 150,000 structures, including those on three-quarters of the acreage in Meyerland – and turn the acquired land into parks. Buying out so many people would be a “monumental task,” Pope acknowledges – and he suggests that the process should be phased in slowly, over decades, focussing first on the most risk prone structure. Pope says that the only alternative is to repair flood plain buildings after each successive flood, at great expense and with no obvious end game. Timon McPhearson agrees with Pope’s long-term view. He adds that parks built in bayou flood plains could, as in the Netherlands, help reduce flooding further downstream. Planted with thick vegetation and sculpted with hollows, the land would restrain surface water that would otherwise pour directly into bayous. This piece was originally published in Re:Think, resilience thinking for global development. Daniel Grossman’s and Alex MacLean’s reporting in Texas was funded by a grant from the Pulitzer Center on Crisis Reporting. This work is licensed under a Creative Commons Attribution-NonCommercial-NoDerivatives 4.0 International License.